Mark Jude Poirier is the author of two collections of short stories, Unsung Heroes of American Industry, and Naked Pueblo: Stories, as well as two novels, Goats, and Modern Ranch Living. His books have been New York Times Notable Books of the year, as well as Barnes and Noble Discover and Waterstone’s UK picks. In 2015, Scribner published Intro to Alien Invasion, a graphic novel he wrote with Owen King. He has published nearly thirty short stories that have appeared in Tin House, The Iowa Review, Conjunctions, Crazyhorse, BOMB, The Southern Review, The American Scholar, Epoch, and many other journals and anthologies. In addition, films he has written have played at Sundance, The Toronto International Film Festival, MoMA, and the American Film Festival in Deauville. 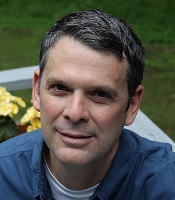 Mark is a graduate of Georgetown, Stanford, Johns Hopkins, and the Iowa Writers' Workshop, and currently holds a Briggs-Copeland Lectureship at Harvard.